We want your shopping experience to be as pleasant as possible. Therefore we are offering FREE SHIPPING for a limited time anywhere in the lower 48 United States on any of our bronze statues or bronze sculptures. So relax, look around, and if you see something you like feel confident that the price you see is your final price. There are no additional shipping, handling, or insurance fees, and unless you are located in Maryland or California, sales taxes do not apply. 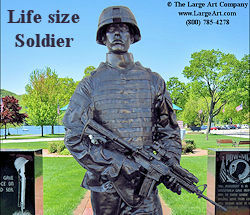 We specialize in bronze sculptures and bronze statues in many shapes and sizes. Our standards for quality are the highest in the industry. We carry many life-size bronze child statues and child sculptures engaged in a variety of activities. The collection includes groups of children as well as individual boy statues and girl statues. We also carry a full line of Frederic Remington bronze statues. The collection includes all of Remington's renowned bronze sculptures including Bronco Buster, Cheyenne, Mountain Man, Rattlesnake and many more. We are also proud to carry many sculptures by Auguste Rodin including The Thinker, The Kiss and Mask of Sorrow. We also carry a wide variety of garden statues, garden sculptures and garden statuary for public areas or your own yard. 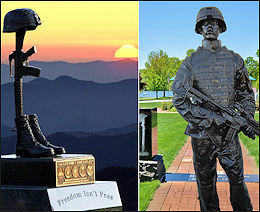 All of our outdoor statues and sculptures can be equipped with mounting nuts for permanent installation. And don't miss our wildlife sculptures and animal statues.